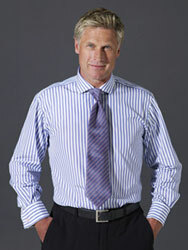 A good stripe shirt is all it takes to make you look apart and this lilac bar code stripe certainly does. The bar code stripe pattern consists of different sized stripes that are closely spaced together. This pattern resembles the lines on a bar code-hence its name.